If you or anyone you know has heart disease, you’ve probably heard the ubiquitous recommendation that people with heart problems should follow a low-sodium diet. The American Heart Association and the U.S. Dietary Guidelines have recommended limiting salt intake – especially for people with high blood pressure or heart disease – since the 1970s, when a researcher first demonstrated that rats given large amounts of salt developed high blood pressure. The rationale is that higher blood pressure can stretch or injure blood vessels and force the heart to work harder than necessary. Today, the American Heart Association recommends Americans consume 1,500 milligrams – less than three-quarters of a teaspoon – of salt daily. (The average American consumes more than double that, about 3,400 milligrams a day.) But a systematic review published last month calls these recommendations into question. The review, published in JAMA Internal Medicine, looked for evidence that a reduced-sodium diet improved the health of adults with heart failure. The authors found nine studies that investigated the effects of a low-sodium diet on adults with heart disease. 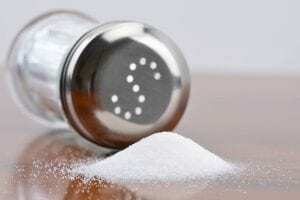 The studies included a total of 479 participants and no single study included more than 100 people – surprisingly small numbers given the millions of people with heart failure who follow low-sodium diets. In the review, researchers found no data that showed reducing salt intake led people to live longer, improve their heart health or avoid hospitalizations due to their heart health. Four of the studies followed people with heart disease outside of the hospital; of those, two found a low-sodium diet led to some improvement in heart function, and two found the diet led to no improvement in heart function. What does all of this mean? The U.S. medical establishment has been making a recommendation that is supported by some pretty thin evidence. Dr. Clyde Yancy, a cardiologist at Northwestern University and lead author on the review, reports that people with serious heart failure should still avoid foods loaded with salt because sodium causes the body to hold onto fluids, which taxes a weak heart. But the medical community needs high-quality, randomized-controlled trials to determine the real effects of salt on heart health. More data will help doctors determine how much salt is too much, and also tailor their recommendations to specific patients. In the meantime, while a patient in heart failure shouldn’t binge on pickles or French fries, it seems that salt may not be so bad for you after all.